When you need a Grease Trap installed call us. 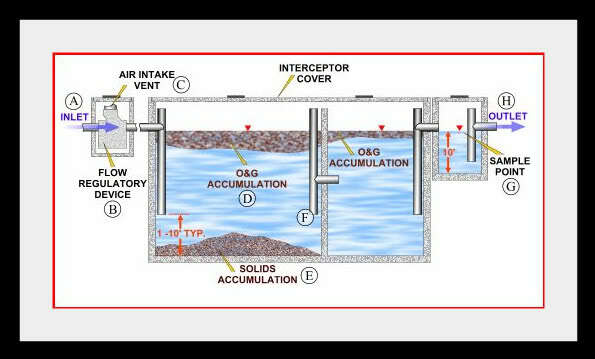 we install and repair grease traps. Most restaurants with larger grease traps will typically employ the services of a professional recycler/ hauler to pump-out and maintain the grease trap when the FOG accumulation gets too high. This is obviously easiest, but can be pretty costly especially if it is a weekly or monthly process. One grease trap maintenance routine that any restaurant or kitchen can implement to control the FOG build up and reduce the necessity of pump-outs is the use of a bacteria additive. Grease trap bacteria aids in the reduction of FOG and other organic waste by biologically breaking down and digesting the waste leaving behind only carbon dioxide and water. This can significantly reduce the need for frequent pump-outs along with controlling odors emitted by the grease trap. Additionally, as some of the bacteria are washed out with the water, it will serve to benefit the municipal wastewater-receiving stream. Grease trap bacteria is available in varying types. Most common is probably the liquid form, which can be poured down the drains or applied directly to the trap. Another popular style is bacteria blocks, which are slow dissolve blocks that are suspended from a rope and submerged into the grease trap. Depending on the size of the block and grease trap, these blocks will last up to 4 weeks at a time. Powder varieties are also available and generally take up less shelf space and are cheaper to ship. Finally, grease traps can be set up with automatic injection pumps to automatically pump bacteria into the grease trap at set intervals for virtually maintenance free treatment. Other things to note to ensure good grease trap maintenance are to be sure and keep records of when maintenance procedures are done, such as pump outs, clean outs, when bacteria was added, etc. Also, staff should be encouraged to not just rinse everything down the drains. When possible, encourage the staff to throw solids and other waste in the trash. Do not hot rinse (hot flush) the drains and grease trap. This means running hot water through the lines to flush out any grease or other build up. This can prevent the grease from cooling in the trap and cause grease to be flushed into the sewer lines resulting in fines from the city. Finally, be weary of enzyme only products. There are many products on the market that are made up of enzymes and surfactants that simply liquefy the grease to get it out of the grease trap. All this does is cause more issues down stream at the wastewater treatment level due to the eventual coagulation and solidification of this grease. It is for this reason that many municipalities are prohibiting the use of such products. Installing the Grease Trap tank whether above or below the ground is only about 60% of the job completed when is comes to gaining approvals from the local Water Authority and Trade Waste Inspections. Extras in relation to grease traps can be varied and many. Trade Waste which is what the grease from your commercial kitchen is now classified as needs to be unable to contaminate the drinking water supply. In this case the Australian Standards require that Water protection devices or what is called Backflow Prevention Devices are install. Most Businesses require 2 of these devices. Floor waste drainage components called Solid Basket Traps, Basket Traps or Brasket Strainersare also required.